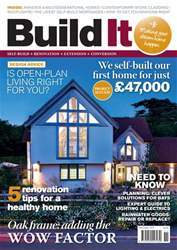 We have just completed our Hanse Haus eco home following two years of planning and hard work – and reading Build It, of course. It has been tough but well worth it for the end result. However, there’s one niggle: on applying for a Feed-in-Tariff (FiT) for our solar electric panels, we found that we will only be eligible for the lowest rate (barely worth it at 0.48p per kW). This is because we received our energy performance certificate (EPC) after commissioning the array. It seems that we should have waited before installing any renewables – but we wanted to be generating power from the date we moved in.